As a homeowner, if you wanted to bring life and add color to your concrete or even change the look of an old damaged floor, concrete staining might be a good option for you. If you still don't know yet, Concrete Contractors Cincinnati has been providing numerous successful concrete staining projects all over Cincinnati, Ohio and everyone who asked our assistance was totally drawn to the unique outcome of their stained concrete. We take advantage of the concrete's porous ability that is just so perfect to be embellished with decorative colors. Stained concrete also offers design versatility that allows you to achieve a look that is distinctly your own. This is just one of the many reasons why concrete staining is such a well-liked application that can beautify your concrete stairs, patio, walkway and anywhere in your house. For you to be aware, our company works with two different types of stains, we have the water-based acrylics and the acid-based chemical stains. With water-based, it is more similar to paint or wood stain because the pigment particles it contains are deposited directly into the pores of your concrete giving it a more radiant effect. This type of concrete offers a much broader array of color options than with the traditional acid stain. 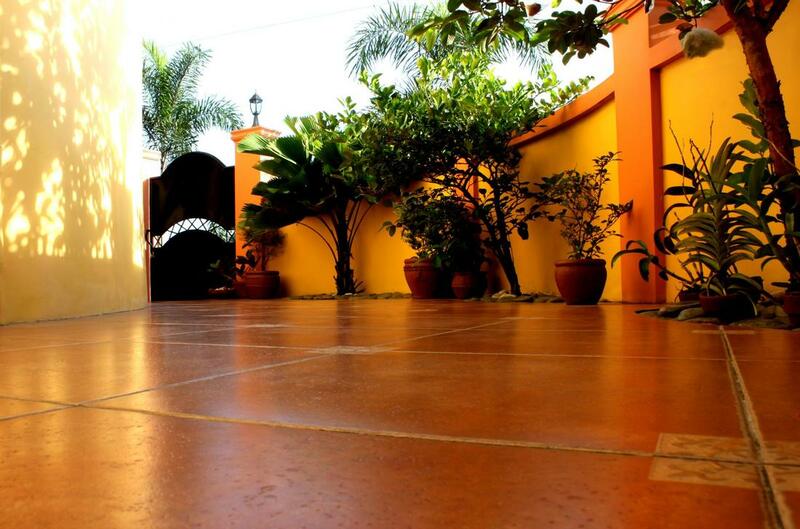 While for the acid stain, it features metallic salts that react with the lime content of your concrete. The result when applied is a semiopaque polychromatic tone that is somehow similar to a marble. Using the different type of concrete stain of your choice, our concrete contractors will be able to achieve the rich, earth-toned color schemes resembling a natural stone or even a leather appearance that will give your cement floors, driveways, walkways, patios, and more a complete elegant custom look! With our help, we will make sure that you get a distinct output that you'll be proud of. Asking for a professional help in doing the concrete staining for your floors is the best thing that you should do if you wanted to have the best staining output and to also avoid risking your own money and your time. Concrete staining involves complex processes and is way too detailed for you to give it a shot. Though you can find some tips on the internet of how you can stain your concrete, it is always a wise decision to spare yourself from all the hassles by hiring a professional staining company, Concrete Contractors Cincinnati. You may find other concrete companies in Cincinnati, Ohio but nothing comes close to the quality and reputable services offered to you by the contractors we work with. Our team will work on your floors and provide you with the stylistic staining you haven't expected to exist. This is because we only hire talented and experienced concrete contractors and masons who have the ability and competence in doing the job. Those who already trusted our company were amazed with how we valued our promise of providing the best concrete staining service that our costumers deserved. We hope to see your property being part of our accomplishments!